MFES wants to keep you and everyone in your home safe from a fire. Follow our additional fire safety tips below to help you in preventing any fires in your home. We have translated fire and life safety information in the City's top ten (10) non-official languages (including French). These are: Arabic, Chinese, Italian, Polish, Portuguese, Punjabi, Spanish, Tagalog, Urdu and Vietnamese. MFES' translated Fire Prevention pamphlets. Learn how to operate and maintain your BBQ safely. BBQs are approved for outdoor use only. They emit carbon monoxide, a poisonous gas that can lead to unconsciousness and even death. Propane cylinders may not be used or stored inside any structure. Store fuel, propane and other combustibles outside - keep them in a well-ventilated shed or detached garage and away from direct sunlight and other heat sources. 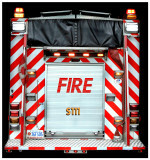 Fire Prevention Canada's fact sheet - "Danger! Gasoline"
NFPA's tip sheet - "Grilling Safety"
A propane cylinder is transported in a service elevator. When there are no service elevators, you may use the passenger elevator, but you must be alone. The cylinder is kept on the balcony and connected to the BBQ. The BBQ is kept clear of combustible material as listed on the BBQ's rating plate or in the certified instructions. The propane cylinder relief valve is at least one metre horizontally from any building opening below it, and three metres from a building air intake. For all open air fires, other than cooking fires and those in a manufactured outdoor fireplace (chiminea), you're required to obtain a burning permit, as per By-Law 49-03. NFPA's tip sheet - "Portable Fireplace Safety"
NFPA's tip sheet - "Gel Fuel Safety"
"Make the right choice, the safe choice and leave fireworks to the professionals!" You are only allowed to set off fireworks on your own property on Victoria Day, Canada Day or any other day for which a permit has been issued by the Fire Chief and only then on your property on that day, as per By-Law 293-01. 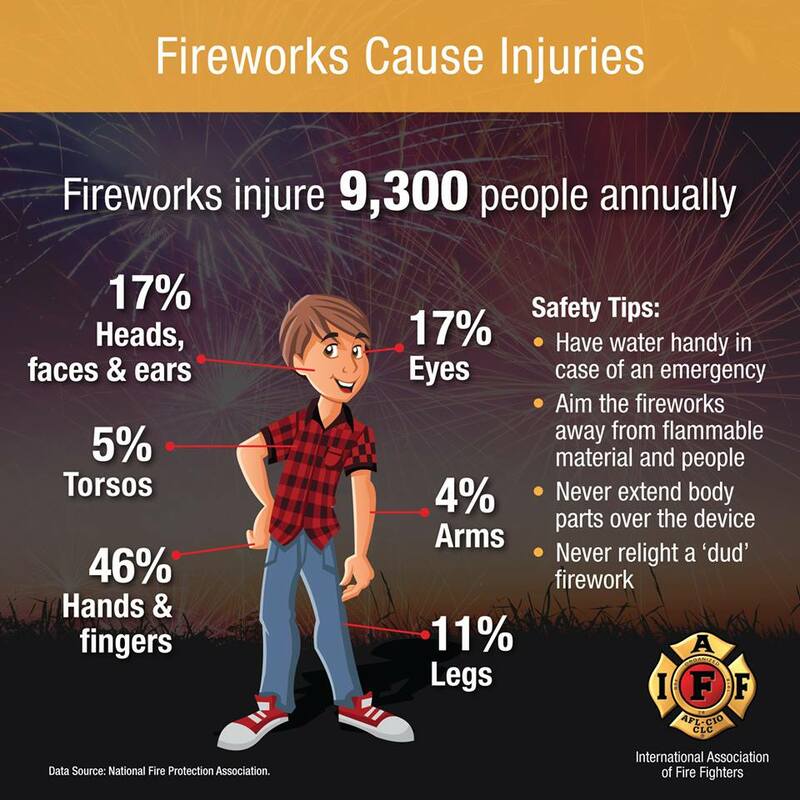 NFPA's tip sheet - "Fireworks Safety"
NFPA's Infographic - "Fireworks Cause Injuries"
NFPA's tip sheet - "Sky Lanterns Safety"
Garage fires tend to spread farther and cause more injuries and dollar loss than fires that start in all other areas of the home. For free and safe disposal of your household hazardous waste (i.e. paint cans, oil, etc. ), please contact the Region of Peel. NFPA's tip sheet - "Car Fire Safety"
NFPA's tip sheet - "Safety with Oily Rags wet with flammable or combustible liquid"
Don't use an extension cord when charging an appliance. A ceiling made with 5/8-inch Type X gypsum board (or the equivalent) if you have living space above the garage. A wall with 1/2-inch gypsum board (or the equivalent) if the wall attaches the garage to your home. City of Mississauga's Council approved changes to make it easier and less costly to register second units. Visit the Housing Choices website for updates. A few things that our Fire Prevention Officers will be looking for when inspecting your second unit are: a separate entrance/exit, installed and working smoke alarms and carbon monoxide alarms, electrical work that was done by a certified electrician and proper fire separation in between occupancies. 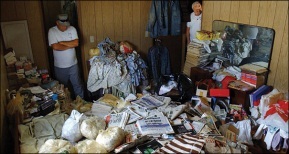 Excessive accumulation of materials in homes (hoarding) poses a significant threat to firefighters when fighting fires and responding to other emergencies in these homes as well as to residents and their neighbours. NFPA's tip sheet - "Hoarding and Fire: Reducing the Risk"
NFPA's tip sheet - "Lightning Safety"
NFPA's tip sheet - "Floods; Get Ready"
NFPA's tip sheet - "Hurricanes; Get Ready"
Keep 9-volt batteries in their original packaging, or keep posts covered with tape, as a loose 9-volt battery is a fire hazard since the positive and negative posts are on top, in close proximity to one another. If the ends come in contact with anything metal, i.e. other batteries, loose change, keys, paper clips, aluminum foil, steel wool, etc. this could create the objects to heat up and ignite a fire. 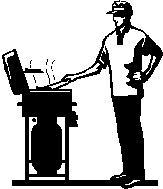 NFPA's tip sheet - "9-volt Battery Safety"
NFPA's tip sheet - "Lithium Ion Battery Safety"
No one is ever safe from a fire, but seniors are the most vulnerable to fire injury and death. Following are fire safety tips that will help seniors prevent fires and stay safe. Fire Prevention Canada's facts - "Fire Safety For Seniors"
OFMEM - "Are Your Loved Ones Safe from Fire?" NFPA's - "Remembering When: A Fire and Fall Prevention Program for Older Adults"
Scald Burns happen most often in the kitchen. Treat a burn right away. If a burn occurs, COOL immediately and pour cool water (not ice) on the burn. For a burn on the hand, hold it under the tap water. For a larger burn, stand in the shower under the water. Cover the burn with a clean sheet and seek medical attention. Never apply ointment, grease or butter to the burned area. Applying such products, actually confine the heat of the burn to the skin and do not allow the damaged area to cool. In essence, the skin continues to "simmer". After the initial trauma of the burn and after it has had sufficient time to cool, it would then be appropriate to put an ointment on the burn. Ointments help prevent infection. When a burn occurs to the skin, nerve endings are damaged causing intense feelings of pain. Serious burns are complex injuries. In addition to the burn injury itself, a number of other functions may be affected. Burn injuries can affect muscles, bones, nerves and blood vessels. The respiratory system can be damaged, with possible airway obstruction, respiratory failure and respiratory arrest. Since burns injure the skin, they impair the body's normal fluid/electrolyte balance, body temperature, body thermal regulation, joint function, manual dexterity and physical appearance. In addition to the physical damage caused by burns, patients also may suffer emotional and psychological problems that begin at the emergency scene and could last a long time. 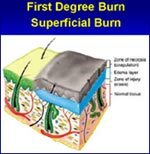 A superficial partial-thickness burn resembles a deep sunburn and is very painful. It will usually heal on its own within ten (10) days. 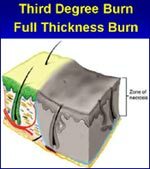 A deep partial-thickness burn is also very painful and blisters will form over the burned area. It may take at least three (3) weeks to heal. 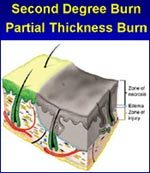 The severity of a burn injury depends on the depth and size of the burn wound, patient's age, the patient's past medical problems and part of the body that has been burned. It is difficult to predict how long it will take for a patient's injury to heal as all individuals recover at different rates. Sunnybrook RTBC - "Burn Prevention & First Aid"
Sick Kids AKH - "Burns: First Aid"
Sick Kids AKH - "Burns In Children"
Fire Prevention Canada's fact sheet - "Burns-the Need for Caution"
NFPA's tips sheet - "Scald Prevention Safety"
When the cold weather hits, it's important to inspect and properly maintain all components of your home's heating system (i.e. fireplace/chimney, furnace, etc). Fire Prevention Canada's fact sheet - "Winter Safety"
OFMEM's Infographic - "Holiday Fire Safety"
NFPA's tip sheet - "Put a Freeze on Winter Fires"
NFPA's tip sheet - "Top 10 Winter Freeze Tips"
NFPA's tip sheet - "Fire Safety during Winter Storms"
NFPA's tip sheet - Winter Holiday Safety"
NFPA's tip sheet - "Christmas Tree Safety Tips"
NFPA's tip sheet - "Wood & Pellet Stove Safety"
Remember to always use a spark screen or glass door in front of your fireplace and have your chimney professional cleaned annually. 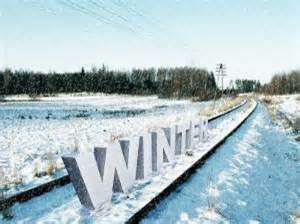 Please remember to always keep fire hydrants cleared of snow! It is often difficult to recover from a traumatic event such as a fire or natural disaster. Learn how to get your life back to normal as quickly as possible. 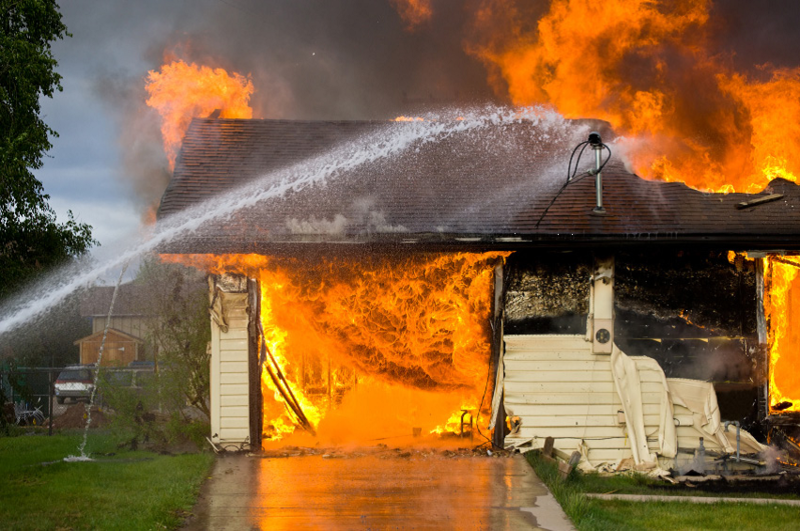 Click here to view MFES' "Guide to Fire Recovery".